The federal and provincial governments, as well as other organizations, have a variety of programs to assist Caregivers and Care Recipients. Please follow the links to the various programs. If you would like to discuss them, or need assistance of any sort, please give us a call. The Continuing Care Branch of the Nova Scotia Department of Health and Wellness (DHW) offers many programs. Below is a list of some of the programs and services Continuing Care offers. and other supplements. Please contact your Continuing Care Coordinator for more information. 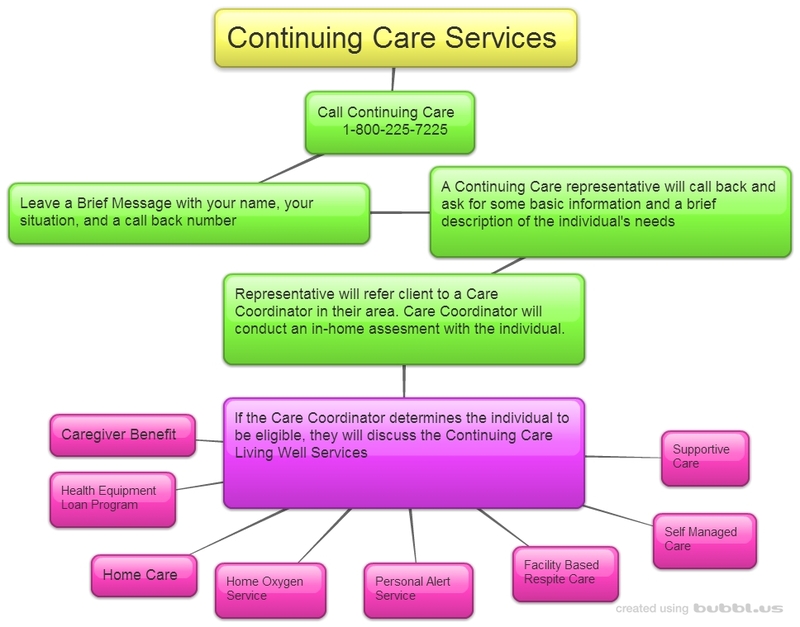 Before scrolling through the list, it may be helpful to read their useful guide: Living Well: Continuing Care Services. It contains general information about the DHW, respite services, qualifying for the Caregiver Benefit, placement and costs for long-term care, and contact information for the Nova Scotia Health Authority. More information can be found on the Continuing Care website, or by calling toll-free (in Nova Scotia): 1.800.225.7225. To find out what happens when you call, click here. If you are calling from outside of Nova Scotia, click here. Home Care - Home care provides service to Nova Scotians of all ages who need care in their homes and communities to help them remain as independent as possible as long as possible. Home care services include home support (such as personal care, respite, and light housekeeping), nursing care (such as dressing changes, catheter care, and intravenous therapy) and home oxygen. To be assessed or to have a family member assessed for home care services, call 1.800.225.7225. Self Managed Care - This program helps many Nova Scotians with physical disabilities to increase control over their lives. It extends funds to eligible individuals so that they may directly employ the people who provide home support and personal care needs. Caregiver Benefit - The Caregiver Benefit Program, formerly known as the Caregiver Allowance, recognizes the important role of caregivers in their efforts to assist loved ones and friends. The program is targeted at lower income care recipients who have a high level of disability or impairment as determined by a home care assessment. If the caregiver and the care recipient both qualify for the program, the caregiver will receive the Caregiver Benefit of $400 per month. Supportive Care Program - supports eligible Nova Scotians who have cognitive impairments (difficulty thinking, concentrating, remembering, etc.) by providing them with $500/month for Home Support Services. Please note: to receive funding for Supportive Care, you must be 65 years or older. Nova Scotia residents who are under 65 years of age must have a diagnosis of dementia to be eligible. Please see the program factsheet for more details. Facility-Based Respite Care - The purpose of a respite bed is to provide a caregiver with a planned and temporary break from caregiving responsibilities. Aboriginal Continuing Care - Registered First Nations living on-Reserve in Nova Scotia have access to home-based health care and residential care through provincially and federally funded programs. Personal Alert Service - This program provides financial assistance to low-income seniors who live alone, receive publicly funded home care services, have experienced recent falls, and use a cane, walker or wheelchair. The program provides up to $480/year to reimburse approved seniors for the purchase of a personal alert assistance service. Adult Protection Services - The Department offers help and support for people age 16 or older who are abused or neglected and who cannot physically or mentally protect or care for themselves. Continuing Care Fact Sheets - These fact sheets and forms will give you more information on Continuing Care services. Nova Scotia Pharmacare Program - Nova Scotia provides assistance to eligible residents through various programs to help pay for prescribed medications and supplies listed in the Nova Scotia Formulary. Palliative Home Care Services - Palliative Home Care is compassionate end-of-life care which is provided to an individual who is terminally ill. Services may include Nursing, Home Support, and the Palliative Home Care Medication Coverage program. The Nova Scotia Department of Community Services also offers support through their Disability Support Program (DSP). There is a range of voluntary programs designed to support people at various stages of their development and independence. To access these programs, please click HERE. The Alternative Family Support (AFS) Program supports persons with disabilities in an approved, private family home. The Independent Living Support (ILS) Program provides up to 21 hours a week of supports and service to eligible individuals who are semi-independent and require minimum support in their own apartment or home. Approved Community-based Homes - Community-based homes refer to residences that offer programs designed to meet the support needs of people with disabilities. Licensed Homes For Special Care - The Services for Persons with Disabilities (SPD) Program provides a continuum of residential support options for individuals with disabilities. The Direct Family Support (DFS) Program provides supports and services to both children and adults with disabilities who live at home with their families. The intent of the program is to support and provide funding to eligible families to enable them to support their family member with a disability at home. Home Adaptions for Seniors' Independence - Housing Nova Scotia offers financial assistance for home adaptations that will help low-income seniors to continue to perform daily activities in their home independently and safely. Disabled Residential Rehabilitation Assistance Program for Homeowners (RRAP) - Housing Nova Scotia offers financial assistance to allow homeowners and landlords to pay for modifications to make their property more accessible to persons with disabilities. Adult Service Centres - provide employment, skills training and day program opportunities for adults with disabilities in communities across Nova Scotia. The Nova Scotia Department of Seniors coordinates various programs and services for seniors in Nova Scotia. This work is done in cooperation with the many other provincial departments and agencies that plan and deliver programs and services for seniors. The Seniors Safety Program is a community-based program that addresses the safety concerns of seniors. Efficiency Nova Scotia has a range of programs to help Nova Scotia residents make their homes more energy efficient, and save money at the same time. Programs include HomeWarming (for low-income residents), Instant Savings, Appliance Retirement, and Product Installation. Call to find out more and to find out about getting your home energy assessment. Toll-free: 1.877.999.6035. Canada Revenue Agency (CRA) have created a series of videos you may find helpful called Tax Measures for Persons with Disabilities. They explain the credits & deductions, including a few listed below, that are available to persons with disabilities and their caregivers. We have also developed a CRA Help Sheet (2 min. read). It tells you where to get help to complete your tax return and has important information on applying for specific credits like the Disability Tax Credit. You'll also find tips on what to do (and say) when you call CRA. Canada Caregiver Credit (CRA) - If you support a spouse or common-law partner, or a dependant with a physical or mental impairment, the Canada Caregiver Credit (CCC) is a non-refundable tax credit that may be available to you. The CCC combines three previous credits: the caregiver credit, the family caregiver credit, and the credit for infirm dependants age 18 or older. Please contact CRA for more information. Compassionate Care Benefit (EI) - These are Employment Insurance (EI) benefits paid to people who have to be away from work temporarily to provide care or support to a family member who is gravely ill and who has a significant risk of death within 26 weeks (six months). A maximum of 26 weeks of compassionate care benefits may be paid to eligible people. Disability Tax Credit (CRA) - The Disability Tax Credit (DTC) is a non-refundable tax credit that a person with a severe and prolonged impairment in physical or mental functions can claim to reduce the amount of income tax he or she has to pay. You must first determine if you (or your dependant or spouse) are eligible for the DTC and submit an application before you can claim the disability amount on your tax return. Family Caregiver Benefit for Adults (EI) - allows eligible caregivers to receive up to 15 weeks of financial assistance to provide care or support to a critically ill or injured adult. Caregivers must be family members or someone who is considered to be like family by the person needing care or support. Family Caregiver Benefit for Children (EI) - Formerly called Special Benefits for Parents of Critically Ill Children, this benefit allows eligible caregivers to receive up to 35 weeks of financial assistance to provide care or support to a critically ill or injured child. Caregivers must be family members or someone who is considered to be like family to the child needing care or support. Home Accessibility Tax Credit (HATC) - A non-refundable tax credit for qualifying individuals to make renovations to, or purchase products for, the home that are required for the individual to access the home or function/move around in it. Contact CRA for more information on qualifying expenses and other eligibility criteria. Medical Expense Tax Credit (METC) - A non-refundable tax credit that provides tax relief for individuals who have sustained significant medical expenses for themselves or certain of their dependants. The CRA website includes a list of common medical expenses and whether they are eligible. Veterans Affairs Canada - have a number of services and benefits available for former members of the Canadian Forces, RCMP, and their families. For example, the Family Caregiver Relief Benefit (FCRB) is a new benefit that provides eligible Veterans with a tax-free lump sum grant, and the Veterans Independence Program (VIP) helps someone remain independent and self-sufficient in their home and community. Canadian Red Cross Health Equipment Loan Program (HELP) - The Red Cross has several equipment loan programs available that are tailored to the needs of Nova Scotians. Equipment ranges from crutches and canes to specialized equipment such as wheelchairs. The Red Cross also provides hospital beds for recovery, palliative care at home, and home support for individuals determined to be eligible after an assessment by a Continuing Care Coordinator. Call Continuing Care at 1.800.225.7225 or visit their website for more information. Your Way to Wellness - is a provincially sponsored, free program, led by volunteer Lay Leaders. The Program is designed to help those with chronic (ongoing) conditions learn skills to live a healthier life. People who have chronic conditions can attend the program with a support person of their choice.